I'm guessing your coming from the Marmotte restaurant/Borsat lift towards the Marmottes lift. Is the Mont Blanc lift in the background ? Any guesses for 'where is this' posting from yesterday!??? Tough one but I going to say along the Cunaii ridge but can't tell from the angle of the photo whether it is steep enough for there. Mont Blanc green run past the Val snow park? kditrj2d - it really is impassable hence the name and without skins, a heli, ice ax and rope you have no hope of getting out! nemesys - yes bottom of the Col Pers descent although you can do the Col without dropping down into the gorge... however some people head down that way (hence others follow the tracks yesterday) heading towards the refuge for touring! So do we know if the 39 people were skiing Col Pers and didn’t veer off at the right time to avoid getting to the Gorge or were they just oblivious about the Gorge being there at all? Was the 3 Swedes rescue mentioned previously from the same Gorge on a different occasion? Here's a picture of me at the gorge, in October. I was hiking up to Prariond. The Gorge is about 50m deep from the path and you would be on the other side of the Isere, if you had skied down from Col Pers. Any avalanche around here would be fatal. I think some people are looking at the wrong picture btw - I'm pretty sure it's the one above the caption that Steve is asking about. I'm thinking maybe Cugnai ridge too on reflection. Cameras always flatten things out a bit plus it's quite well skied out - much less likely Borsat West. @bar shaker, thanks. Good to see it in summer. They must have been stuck with no way out then were they? @Dr John, amazing that so many people were in the same situation. They must have thought they could ski out through the Gorge. Out of interest where do you end up on the occasion where the Gorge is passable (when it’s full up enough)? In comparison to veering off onto the ridge before the Gorge? Why would anyone be dumb enough to ski down there without knowing if you can get across? It looks like a fun off piste expedition (obvs I'd only go with a guide), even for someone who's not brilliant at off piste. I don't think I can see the photo you guys are talking about, I can only see two posted. You can see the jumps (albeit covered in powder) in the Val snowpark. It's defo just below the Borsat lift on the way to Marmottes. It's worse than that, there is a sign at the top telling you that you cannot get out. There is no guesswork involved. It's a great route when it's open but the gorge is a serious terrain trap if the avi risk is high. You follow the gorge down, past Pont St Charles, all the way to Fornet cable car/bus stop. @bar shaker, and where does the Col Pers route end if you swerve the gorge? @VolklAttivaS5, same place, but from slightly higher up. Until the gorge is open it's not, IMHO, worth doing Col Pers as you don't get many turns in before you have to cut left. This is the image in question I think?? @Dr John, ok thanks, just wondered as I might turn up in the EK towards the end of the season. I’m sure I’ve done Col Pers before though when I’ve been in a guided group years ago, I will probably recognise it when I see it from the start. 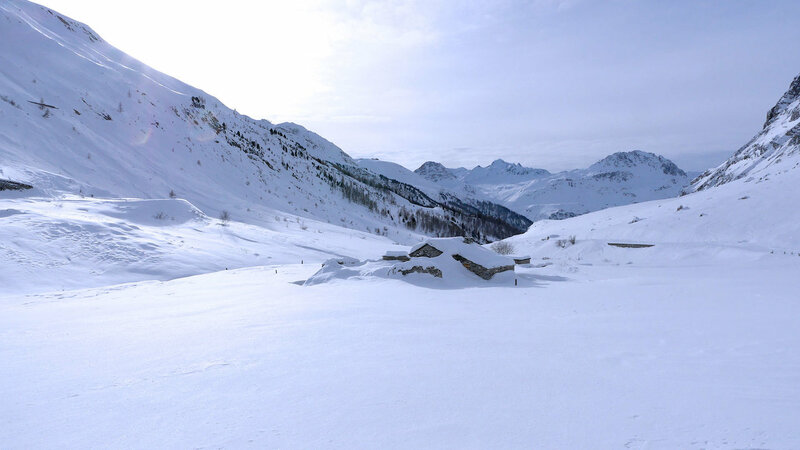 My memory is a bit hazy as I’ve not been to Val D’Isere for yonks now. @VolklAttivaS5, Needs another shed load of snow and an avi into it to fill it enough. Guides I know say they doubt it will open this season, but you never know. @Dr John, ok thanks good to know. I am with @DrJohn, might be Grand Vallon? Last year in April I skied the Gorges via Col Pers, and it was unbelievable full of snow, there was no gorge, only a flat piste. The problem is, that for abour 5 years there was a rock fallen from a higher point into the gorge and from this moment on it was unskiable the most of the time, there must be a big amount of snow to fill the gorge and pass the stone. In the 80´s and 90´s there was no problem to ski the gorge every year from minimum february on, in years with early big snow also on christmas or new year. Firstly there has been some great chat above about the Col as well as lots of debate about 'that' photo and yes nemesys - that is the correct photo - some confusion before. I love the thinking Dr John it REALLY could be Grand Vallon... looking back up over your left shoulder as you ski down on the left hand area as you descend couldnt it... but I think the winner (for guessing right first up) is sno trax - the photo was taken looking right as you go up the Cugnai chair. Well done... some interesting thinking folks! So after taking Ben to creche I headed to the meeting point. It was once again snowing hard and the powder that was out there was awesome I have it on good authority! The only problem was that the visibility was shocking for the first hour... this was good for me and my team as we wanted quiet slopes so that we could work on some carving and work on carving we did! We headed up the Solaise and thankfully it was somewhat warmer than it has been. We did a fair few laps mainly on the Glacier Express and made some good changes for them to develop in their own time. About 11am the clouds seem to part and the sun came out... thats a little like a red rag to a bull as that signals to all and sundry that its time to straight line down everything in packs of people... however on the flip side we could at least see. Anyway it was a good session! It was a quiet lunch and afternoon at home which was nice! I totally forgot to get a photo today so I will have to use Radio Val's pic instead - it is a good photo non the less! Also an interesting note from Radio Val today today, I thought it worth sharing! 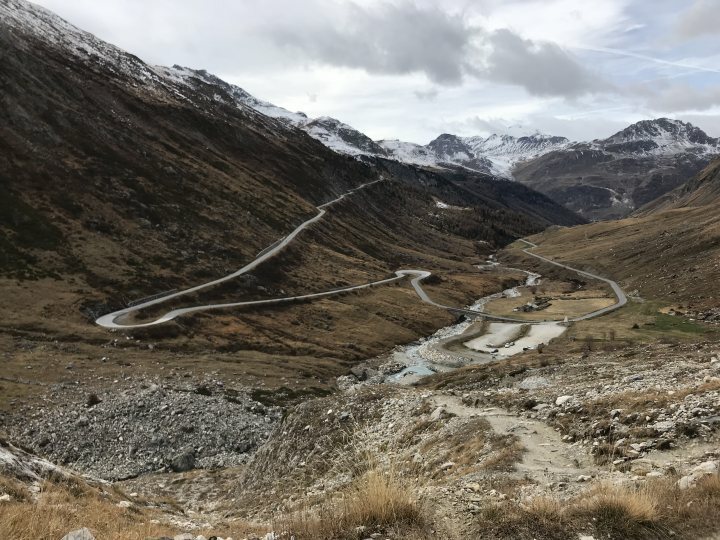 "The number of skier days recorded by Val d'Isère Cable Car was at the end of last week up from 2018. Cumulative since the beginning of the season until the end of last week, the STVI has recorded 586 319 Skier days, which represents an increase of + 2%. The new La Daille gondola is a success with an increase of 80% more visitors than last year in the old gondola. On the other hand, attendance at the Funival is slightly down. And then, we ski a lot more. The number of lifts in general is up 30% compared to last year. This means that for the same number of skiers, the use of lifts is much greater than before, which leads to more intense skiing on the ski area than last year." @Steve Angus, thanks for a great session yesterday morning. Really enjoyed ourselves and lots to take away and work on. Does me good to ski in bad visibility- if you don’t put yourself out there it’s easy to lose the touch of skiing without the lights on! Here's a couple more photos of the Malpassant area. The first is looking from the gorge down towards Fornet. In the foreground is Pont St Charles. The little pool in front is where all of our tap water comes from in Val. 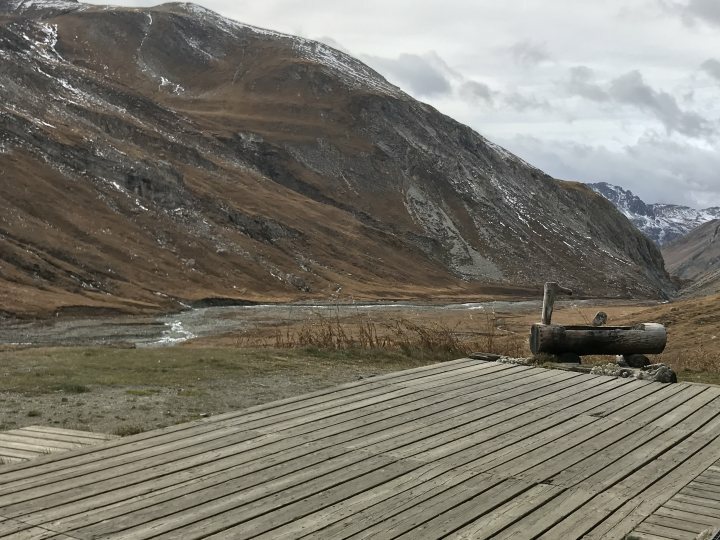 The second photo is from the deck at the refuge at Prariond (source of the Isere river). This is a lovely (and easy) hike, during which you will see plenty of ibex and marmottes, some only 30m away from the path. If you had skied down to the gorge and it wasn't passable, you could in theory skin up towards the refuge, cross the river delta (it's very shallow) and exit on the trail path on the northern side of the gorge. This trail gets used quite regularly by people skinning up to the refuge, on their touring trips. Yes I think I’ve been there now I’ve seen it from that angle. Probably more than once! lynnecha - thanks so much - glad you enjoyed and have stuff to work on. Make the most of your last week in town! bar shaker - lovely photos - thanks for sharing! With it looking like it was going to be a 5 day today, high winds, poor vis and all the rest that goes with a 5/5 day (bearing in mind that 5/5 days only come about on average about once a season and sometimes we go seasons between them!) I envisaged a duvet day... well provably not as there was a chance that school would be cancelled etc. Anyway I was MOST surprised when I opened the curtains this am and there was barely any new snow at all really! There also didnt appear to be much in the way of wind out there - it was just grey! So everything was 'on' for the day.... Olivia was off on the school bus, I took Ben to creche and then on the way back from that I got a call saying they needed me to teach this am after all... so it was action stations to quickly get myself geared up and off to the meet point as I was not planning on working this am! Anyway it was pleasant up there - it really was. The BIG thing I noticed was that the air temp was really much higher than it has been of recent! I even DIDNT have my heated socks on today - it must have been warm! We work our way through the gloom of the magic triangle in the clouds and snow and had a very good morning... ultimately we tackled some red runs and little by little rebuilt her confidence right up. She had a big smile on her face at the end of it so I think she enjoyed it and got a lot out of it! Lunchtime was a rushed affair - luckily I had a sandwich I had managed to pick up from the Sun Bar in my pack but it was back to the office, grab some off piste kit and each my lunch before heading across to the Gourmandine for my pick up! With L this afternoon we found some nice snow for some off piste... Bus stop, variations around the Mangard piste trees and a few other things - it was a fun afternoon and with the snow still falling the snow off piste is now very deep indeed! It has been a relaxing evening as the kids are zonked from a long week and then we ordered a take away pizza for dinner. I am really hoping that I will get an early night as I have been promising myself one all week! So it should be another snowy night and then more snow on and off for another few days so conditions could still remain juicy out there! Last night with the snow falling the roads were dicey and one vehicle came off badly on the road up from La Daille near the dam - oh dear! Well not really but it was close as you get during the Winter season! Despite the kids not having the best nights sleep and the day starting at 6am it was a relaxing start to the day. The sun was shining and it was a bluebird day. Family breakfast was followed by Clare heading out for a ski with Olivia AND Olivias school friend coming out with them! Ben and I had an exciting morning playing together and it was a sports fest on tv - skiing, rugby and cricket - thats my boy as he sported his cricket top but I wish I had put his rugby shirt on instead - whoops! Clare made it back with Olivia and friend about noon and it would seem as if there was lots of messing about going on and it continued as the girls got back for lunch! It was a rather fraught couple of hours and when finally Olivias friend went home and both kids went for a snooze it was peace again! Yay! I ALMOST dozed off on the sofa myself! Meanwhile on the mountain I was being swamped with photos and videos of colleagues on their day off etc getting an amazing powder day in! Jealous - hell yea! Finally when the kids were awake we had a lovely evening all together... some games and fun and then a family meal altogether - curry anyone! Not the most interesting update this evening I am afraid. Tomorrow it looks like I have not been booked in the morning (at this stage) so it will be some more family time together - perfect.... recharge there batteries before the half term period kicks in. @Steve Angus, I realise visitor numbers increase dramatically from next weekend, when French winter holidays start, with Zone A. Just wondered what your view is on how much busier things would be than late Jan or this week please? Are we talking scrums in the main lift queues and wacky races down the mountain late afternoon? Or is that when the really big holiday weeks kick in from 16 Feb onwards? PeakyB - hmmm interesting question: id look at it this way... take a 'typical' and crucial lift like the Marmottes lift up the Bellevarde... 6 seater... low season - like most of January - wait for a couple of chairs to go past before its your turn max for most of the time. A week like Xmas week / 2nd easter hols week / 1st week of French school hols... wait for 10 chairs to go past before its your turn... and need to book restaurants in advance for lunches etc BUT likely to get something as long as you pre-book etc... NY week / main easter week / 2nd week of feb half term (this year Parisian and Brit weeks clash - arghhh) - 30/40 chairs need to past before its your turn / not a hope in hell of getting 1st choice of restaurants in advance etc / scrums and a few elbows coming out in lift queues and on the slopes yes! The way I look at the weeks personally in terms of lesson booking levels / peak season - no lesson slots available the best part of a year away from the date / shoulder season - week is more or less booked up in advance with last few slots going the week or so before the date so it ends up being 100% booked for the week and low season - generally gets about 75% booked up one way or another by the end of the week. Hope that helps! There was a surprisingly large amount of snow to fall overnight BUT with the wind turning around.... this meant that there was a lot of blasting going at breakfast time and in the end there was a delayed opening. Anyway the kids had a reasonable nights sleep and we started off with a family breakfast before getting ready for a family swim. We had a really fun time swimming and as usual everyone under the sun was in the pool on a Sunday morning (they have ALL the kids toys and inflatables etc in the water on a Sunday am as it really is a family swim time AND they raise the temperature of the water right up then too!). So Olivia and Ben had a great time in the pool and it was quite sociable too as we new loads of people in the pool. Lots of fun! After lunch back at home the kids had a sleep and Clare and I chilled out. The rest of the afternoon was a mix of phoning the grandparents / watching a family movie / dinner and then kids bed time! Arghhh another day in paradise come to an end! Tomorrow whilst I remember they are doing heli blasting to clear all the backlog of control PIDA work they need to do... as the sun is supposed to shine and the amount of wind / snow we have had recently means the snowpack is mighty complicated out there now! Anyway think that is all for now. If you are here on holiday in an apartment without wifi then you can rent a 'MIFI' dongle thing from the tourist office! Amazing model of the Val valley in the tourist office too! PeakyB - hmmm interesting question: id look at it this way... take a 'typical' and crucial lift like the Marmottes lift up the Bellevarde... 6 seater... low season - like most of January - wait for a couple of chairs to go past before its your turn max for most of the time. A week like Xmas week / 2nd easter hols week / 1st week of French school hols... wait for 10 chairs to go past before its your turn... and need to book restaurants in advance for lunches etc BUT likely to get something as long as you pre-book etc... NY week / main easter week / 2nd week of feb half term (this year Parisian and Brit weeks clash - arghhh) - 30/40 chairs need to past before its your turn / not a hope in hell of getting 1st choice of restaurants in advance etc / scrums and a few elbows coming out in lift queues and on the slopes yes! Thanks Steve, great description, I can picture just what you mean. A 10 chair wait is OK but 30/40 I wouldn't go Paris week if someone paid me. Home runs like Spaghetti Junction rush hour. BTW, the usual European school hol chart shows Paris weeks 23 Feb-9 March this year. Main UK half term is 16-23 Feb. Your inside knowledge probably more accurate but hopefully no clash? ooo that wi-fi dongle is actually pretty reasonable. The Orange 4G signal is around 30-40megn in Val. For anyone with a UK phone contract, this is free to use. Where's the chopper rescuing Parisians from the Malpasset Gorge? Big slide off the back of Cugani, two choppers involved and alot of people probing in two lines, dogs etc. Doesn't look good. It's a really unstable snow pack at the moment. Combine this with French hols and Monday Morning Heros and it's a recipe for disaster. Hope they have transponders and get pulled out. Unfortunately judging by how they were searching I suspect they weren't wearing a transponder.